A smooth, trailing perennial, very graceful, with beautifully tinted flowers and bright green foliage. The stipules are large, broad and leafy, and the leaflets are usually ten in number, veined and thin in texture, one or two inches long, with tendrils. The flowers are nearly an inch long, from four to eight in a cluster, on a long flower-stalk; the standard pinkish-lilac, delicately veined with purple, the wings pale lilac and the keel cream-color. The flowers, as they fade, although keeping their form, gradually change in color to all shades of blue, turquoise, and sea-green, finally becoming buff, so that the effect of the whole cluster is iridescent and very lovely. This grows on mountain slopes, often in oak-thickets, clambering over the bushes to a height of several feet and clinging to everything with its tendrils. 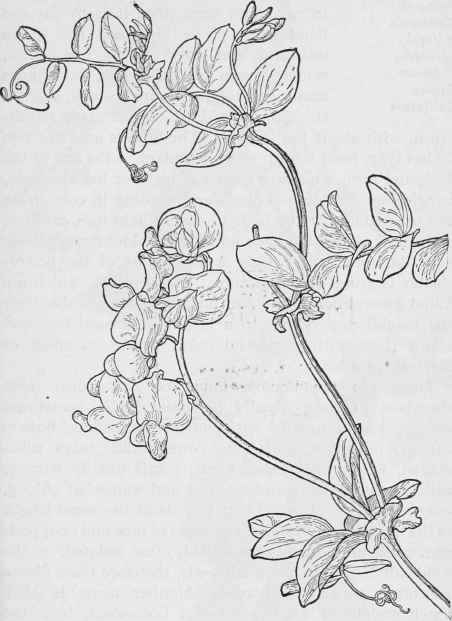 Utah Sweet Pea- LathyrusUtahensis. PEA FAMILY. Fabaceae.